iPhone 6s Specs: 2GB RAM memory shown in new A9 benchmark. A leak last week suggested last week that the iPhone 6s and iPhone 6s Plus might only have 1GB of RAM, which might be a major disappointment for some buyers. However, a new leak from the same source indicates that might not be the case after all, leaving us puzzled. 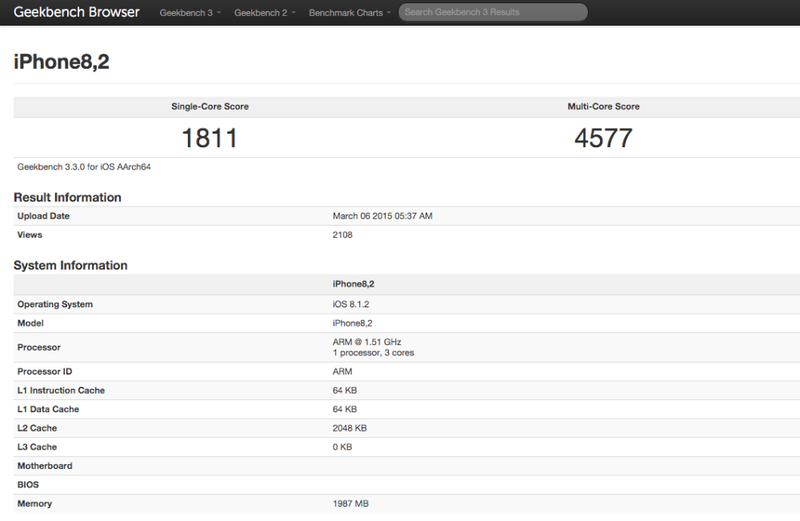 Spotted by Dutch tech blog TechTastic, the new Geekbench Browser benchmark says the iPhone8,2 is going to feature a 1.5GHz tri-core A9 processor and 2GB of RAM. A recent leak claimed that iPhone8,1 and Phone8,2 devices (internal codes for Apple’s new iPhone 6s handsets) had been spotted online by an app analytics company, which means Apple is already testing them ahead of launch. TechTastic further notes that the iPhone 6s should offer users a performance on par with the iPad Air 2, which has a tri-core A8X processor. In fact, comparing the two devices, the site found that the iPhone8,2 beats the iPad Air 2 when it comes to single-core and multi-core performance. Assuming the device tested is indeed a new iPhone 6s, the benchmark result isn’t surprising. The A9 chip is built on 14/16nm technology, which should make it faster and more energy-efficient than its predecessor, which currently powers Apple’s 2014 iOS devices. Apple is expected to unveil the two new iPhone 6s handsets during a press conference on September 9th that’s yet to be confirmed, at which point more details about the phones hardware are expected to be announced. Images showing this newly discovered iPhone 6s benchmark, and the comparison with the iPad Air 2, follow below. This entry was posted in iRumors and tagged apple, iPhone 6S, iphone 6s plus, irumors, iRumorsnow. Bookmark the permalink.